Martha Grocott was born in St. Louis, Missouri on November 27, 1908. She was the only child of Willis H Grocott and Ada McPherson Grocott. After Ben Blewett Junior High School she went at Soldan High School. She started working for Scruggs-Vandervoort-Barney and on November 6, 1929 she married William S Walter. She remarried Phil Davis on November 5, 1934 and at the peak of her career she was the head fashion artist in Vandervoort's art department. In 1941 she began to assist her husbond on the Mandrake strips mainly on women's costumes and those of Narda in particular. When Phil Davis was engaged full time in doing illustrations for the Air Force manuals she sometime did the entire strip. In 1948 Phil Davis said: "And now," says Phil, "she's just as good as I am! After the war, she didn't want to leave Mandrake - so now we work together, and each of us can do any part of the job, or finish the work of the other one." In 1963 Phil Davis said that he illustrated the art comprehensively in pencil and then Martha did the rendering (ink). Phil Davis died of a heart attack at St John's Mercy on December 16, 1964. About that time Mandrake appeared in 253 newspapers and magazines, including 40 outside the US. Martha continued the pencil art for the ongoing dailies and Sundays, with the ink done by a local St. Louis artist. Her last strip was to been seen in 1965, June 5 for the dailies and June 20 for the Sundays. ancestry.com; Missouri Birth Records; U.S. Federal Census 1910, 1920, 1930 & 1940; Yearbook Ben Blewett Junior High School 1921 & 1922; Yearbook Soldan High School 1925. 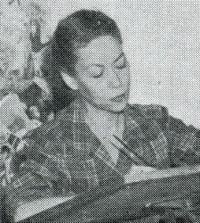 Rochelle Ogden J. Editor & Publisher, "Mandrake and Narda Look Like Creators". January 22 1949. This page was last edited on 26 February 2018, at 19:52.